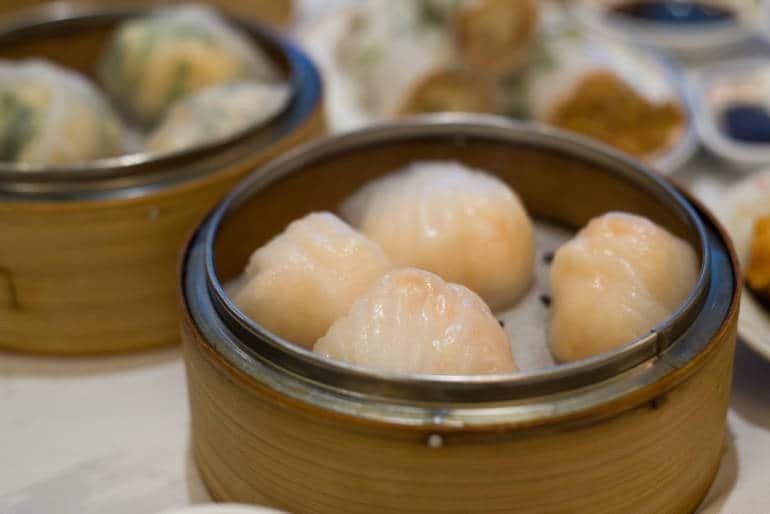 If you’re familiar with any city’s Chinatown you’ll know how to yum cha. 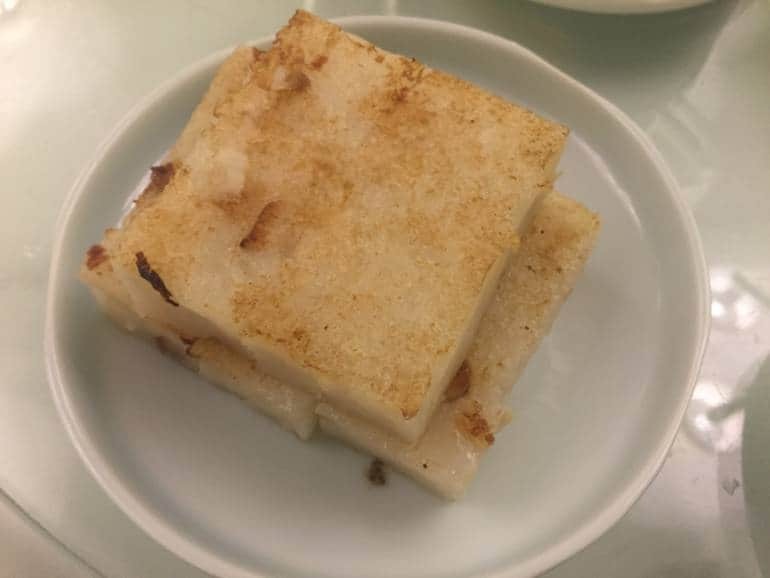 You’ll have come across the little steaming bamboo baskets of delectable bite-sized goodies, but for the uninitiated, here’s HK Cheapo’s guide to that “very Hong Kong” of meals dim sum. These are probably your easiest introduction to dim sum. 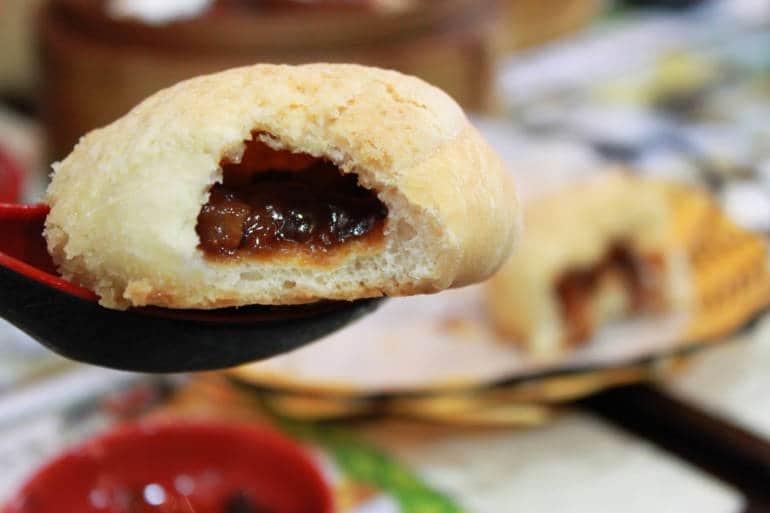 The fluffy white buns filled with sweet and salty barbequed pork and melt-in-your-mouth exterior are likely to leave you wanting more. I’ve known people to go through two baskets on their own. But word to the wise, like a lot of dim sum, these parcels may look small, but they’re often dense and filling. The name is a little deceptive here. There’s no actual pineapple involved in the making of a pineapple BBQ pork bun (Although there’s a thought!). They’re similar to a regular char siu bao with the barbeque pork filling, but instead with a sweet crunchy yellow exterior that resembles the skin of a pineapple. Some people judge the quality of a dim sum place on how good the har gow are. 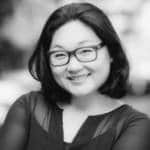 How do you know what’s good? The skin of this classic dumpling should be thin and translucent, delicate, but shouldn’t break when picked up. The shrimp should be flavourful and juicy, but not runny. Another classic dumpling in the dim sum repertoire. This tasty wrapped number combines ground pork, mushrooms, shrimp, green onions and ginger in a cylindrical yellow package often topped with bright orange crab roe. If the restaurant is feeling fancy, they might also come topped with scallop or truffle oil, or even a small shaving of truffle. Rice rolls, come with a variety of fillings, from diced BBQ roast pork to shrimp to dough fritters to shrimp AND dough fritters. The latter is my favourite. If done right that crackle and then pop of freshly cooked shrimp is just beautiful. Drizzle a bit of that sweet soy sauce that comes with it to give it that extra flavour. Just don’t let it sit too long in the sauce if it comes with the crispy filling. Soggy is never good. And have it hot! It’s not the best if it’s gone cold. 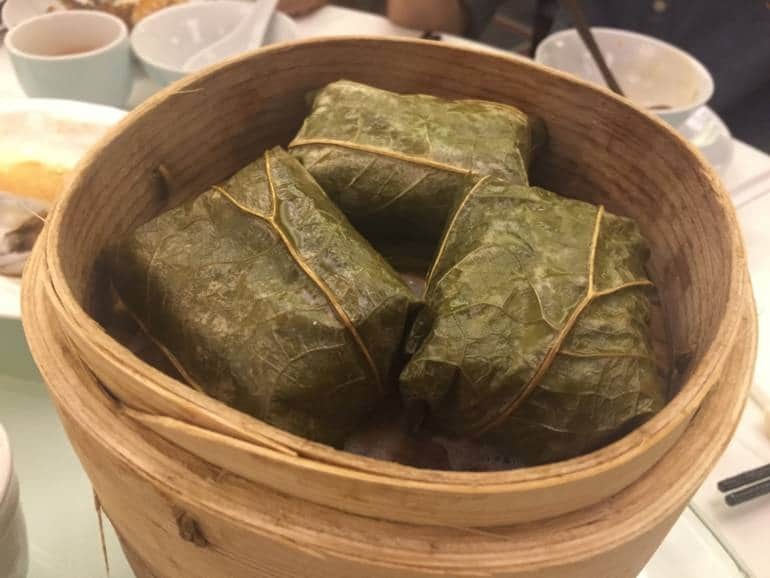 These densely packed steamed sticky rice parcels originally came with diced chicken in the middle, but nowadays have a variety of fillings; sausage, dried scallops, shrimp, mushrooms, pork, water chestnut to name a few. Sometimes they’re bite-sized morsels (jan ju gai), other times they’re great big parcels (lo mai gai) that should be shared. Check out the picture in the menu or peek at a neighbour’s table to see which one might be on the menu. These come either steamed in a tiny bowl or in small pan-fried crispy-edged blocks. I prefer them pan-fried, but others seem to like the steamed ones just fine. If you’re a fan of eating every part of an animal, this dish is for you. 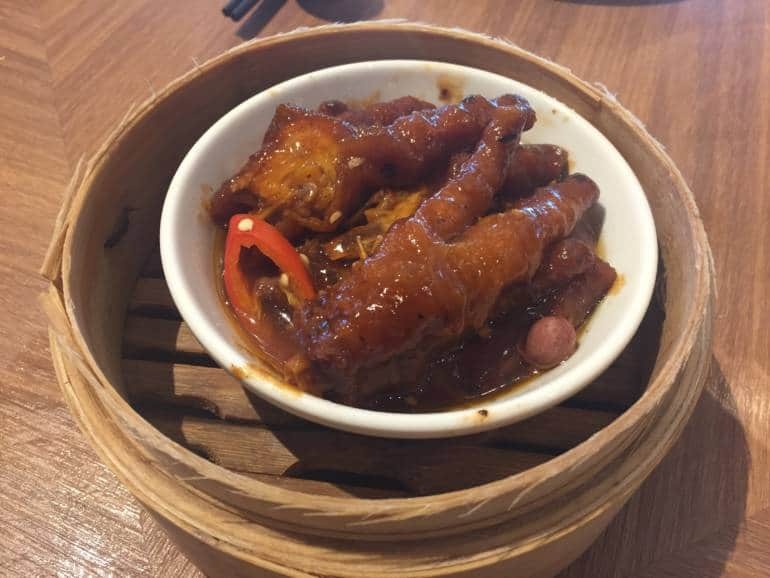 The chicken feet are steamed to the point where skin and cartilage just fall off the bone and coated in a delicious reddish bean sauce. They’re bit difficult to eat gracefully. Yes, you’ll need to spit the tiny bones out on to your plate. (I fish them out with my chopsticks and place them in a little pile on the plate.) But don’t be put off! They’re delicious and worth the effort. Trying to get the little ones to try it? Try telling them they’re eating dinosaur feet. My nephew gets a kick out of that. With that said, I would warn against trying the vinegar version if you’ve not tried these before. The skin on those are firmly attached and difficult to remove, and it really is a bit more of an acquired taste. If it’s edible, there’s probably a variation of congee based on it. A steaming bowl of this stuff always hits the spot on a chilly day, or after a heavy night out on the town. 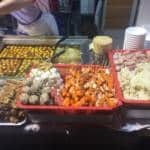 Some classic flavours are sweet corn, 1000-year-old egg and pork (pei dan sau yuk juk) 皮蛋瘦肉粥, sampan (dried squid, peanuts, scallions etc). These sweet tarts were the favourite of the last British Governor of Hong Kong Chris Patten. He liked them with the traditional Hong Kong shortbread crust, but the flaky Portuguese style crust is also a local favourite. Tofu (beans and legumes in general) aren’t just for savoury dishes in Asia. This silken concoction topped with a ginger syrup or sugar is a favourite street snack and Dim Sum dish. A sweet ochre-coloured steamed sponge cake flavoured with molasses. Easy to drink light blonde floral tea akin to camomile. Goes well with pretty much everything. Dark amber fermented tea with a distinct earthy flavour. I find this one cuts the greasiness of some of the oilier items on the menu. I like it with the jan ju gai for this reason. Light-coloured oolong tea. This one starts off bitter, but ends with a sweet finish. Great with dessert. A grassy green tea scented with jasmine flowers. Goes well with lighter items like the Har Gow. Pricing differs at restaurants depending on time. Bargain-hunters may want to eat earlier in the morning or later in the afternoon, as restaurants try and attract people at non-peak hours (or try to entice you into leaving earlier by saying if you pay, say before 11:30, you’ll get a cheaper price). 4-5 small dishes for two is a good amount of food. Take a large group, this way you can try more dishes! When someone pours you tea, tap two fingers (forefinger and middle) as a gesture of thanks. Make sure other people’s teacups are filled before you refill your own. If you need your teapot refilled leave the lid off the pot/slightly ajar. Someone should come by and fill it up again. Don’t dash while dining. With the speed at which Dim Sum restaurants can serve you it’s easy to eat quickly and leave. If it’s a family affair, you might often find Dim Sum can turn into a several-hours-long marathon eating session.